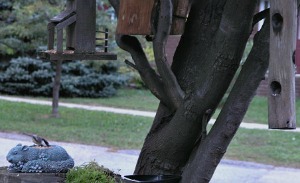 Create an eco-friendly-feeder and attract more wildlife. It's a compostable feeder when finished too, which is even greater for your composter. Makes great use of something that is almost ready for the trash, and it didn't cost a thing. If you like watching the birds in the backyard as much as I do, make something they can come to often and eat to their hearts' content. Very few tools needed, and quite simplistic. There are a few different types of eco-friendly-feeders you can make. One uses fruits or vegetables, and the other uses natural pinecones. Gather up a bunch of large pinecones. They are best if they are hard, and dry. Using twine, ribbon, or string, tie one end to a tip and continue to do this with the original piece of string until you have tied together a large clump of pine cones and the final knot well secured. Get another piece of string, or floral wire, and run it through the middle somewhere to make a loop, for hanging from a branch. Make sure it is well knotted or twisted to hold well. It would be like a large handle on the clump of pinecones. The longer the string or "handle" however you choose to make it, the better, which will help keep the squirrels away from it. Take a knife, or a spoon, and smear with peanut butter in the crevices or spaces of the pinecone. 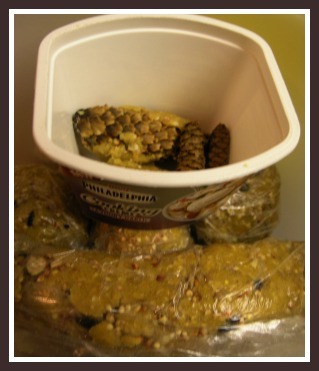 Embed assorted birdseed into the peanut butter and hang your pinecone bird feeder outdoors. The chickadees love these things. Use a baggie full of seeds, and shake the clump inside the bag. Or, if hanging the pinecones individually on string, which you can certainly do, gently roll in seeds. Do you like to eat grapefruit? Squash? Pumpkin especially in the Fall? 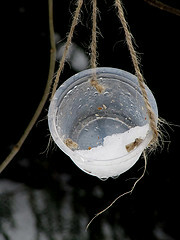 You can make great use of these "shells" to make your own eco-friendly-feeder for the backyard. When you are finished with them, chop up and throw them in your composter. Take a sharp knife, and slice the top off your vegetable or fruit, making sure the opening is large enough for birds to get into, or get at the food. Take out as much as you can of the insides with a spoon or a scoop. Make either 2 holes across from each-other or three equally apart from each-other which is better for support and balance, with a nail or a drill. Be sure to not make the holes too close to the very top; leave a bit of space to prevent ripping. Starting from the outside, run a string through and knot it well on the inside of the hole. Use three separate strings, if using three holes, and make sure they have enough good length for hanging. Make sure the three strings equally meet at the top, and make a few good knots. This is like your handle for the feeder. One length of string is good for 2 holes, making sure there is a good knot at each hole. Fill with assorted seeds or suet and take it outdoors. 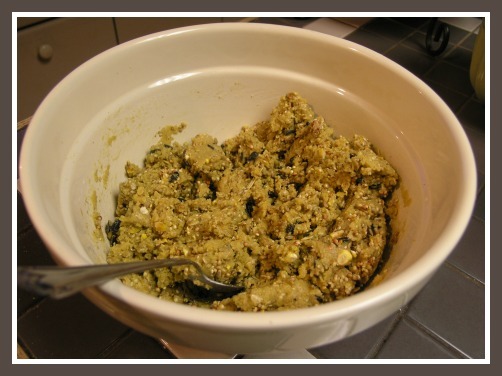 There are many different recipes you can use to make suet, and you can see what I use below. Put your hollowed out birdfeeder in the refrigerator or freezer until you want to put it out. I also stuff the holes of a natural wood hanging feeder with suet. Just break off small chunks. Another favorite of chickadees and Blue Jays. You can use any type of container as a feeder as well. The concept is illustrated here, using the string. 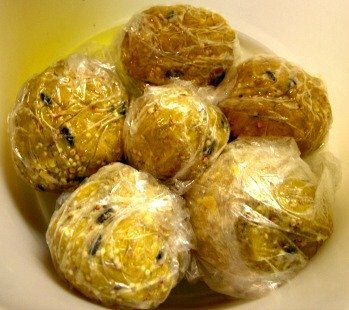 Suet recipes for an eco-friendly-feeder are very easy to make, and of course, used in the colder weather. They are very quick to make, and what I did, was make a rather large batch. When finished, I let cool, and then shaped into balls, wrapped them in saran wrap, and placed a number of them in a box in the freezer. Of course, they were frozen solid, and whenever I needed one, it was very easy to get and put out in just a few minutes. I unwrapped them, and placed in an orange onion skin bag and tied them to a tree branch. They can be placed also in your scooped out vegetable or fruit feeder. Melt the peanut butter and lard in a saucepan, and gradually add the rest of the ingredients. Mix well. Pour into your container feeders, or shape into balls and freeze. You can also pour into a square pan, it doesn't matter. Note - If you are using single pinecones, you can dip your pinecone into this mixture before freezing. Recycled Craft Supplies tells you how to make a feeder out of a milk carton. 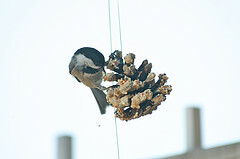 The recycling of store-bought materials makes for an eco-friendly-feeder as well! Scroll down to the ideas sent in by our readers and have a look. These suet recipes can vary greatly. I've added chopped pieces of apple and apple peelings in them. I've made suet recipes without the sugar. This basic recipe will work well and the birds love them! Have fun making your own eco-friendly-feeder.